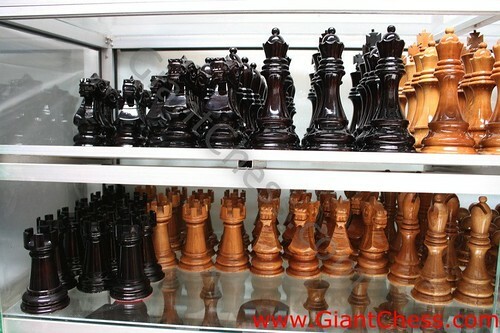 Teak wood chess products indoors or outdoors without worrying about their being damaged by the elements or that their form will change over the years. At the same time, if you want to keep them beautiful and gleaming, they are easy to maintain, using a wet cloth to remove dust or dirt, and a clean cloth to polish. If not in use or on display for any period of time they can also be covered to eliminate the need even for this. You can, of course, also store your chess pieces to keep them clean and safe if desired, depending on size, in a box, under a bed, in a room or warehouse. If your Chess pieces or other chess equipment should begin to lose its luster over a long period of outdoor use or display, an application of varnish can easily bring the shine back.